Relive the glory days of the 80’s guiding Miner Willy through the ‘Solar Power Generator’, defeating Doomdark near the ‘Mountains of the Moon’, or just programming your next BASIC masterpiece. The widget update will copy over the game file directory, so if you’ve added new games to an earlier version: Save the game files, then upgrade, then copy the games back. Pull those bedroom curtains even tighter together and ignore your mother calling you for dinner. The widget comes with a few legally provided games (see below). You can add more games by flipping over the widget, pressing ‘Open Game Snapshot Folder’ and adding your own games to that folder. Only add files that you are legally allowed to - e.g. In some countries these can be games you have purchased. Copyright laws vary from country to county, so check them if you are unsure. I believe the owners of the supplied games allow their games to be freely distributed (according to the web-site World of Spectrum). If you are the copyright owner of one of these games and you would like it removed from the widget distribution contact me and I will be happy to remove it. 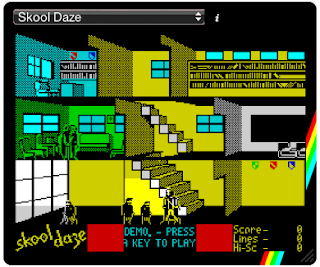 Hi, love the Speccy emulator! Is there anyway of saving a game/snapshot? PS. Made your widget 'Frankenwidget' of the week on my podcast British Mac. No loading and saving snapshots yet. Maybe in version 4. And thanks for the recommendation. What a fantastic bit of work! Great job! Been a while since I've played any of the old speccy games - ahh heady days..etc... Was wondering if you know where I can get some more games to add? World of Spectrum has lots of games. Hi; great widget and Speccy emulator! Do you know if this will work in the iPhone (or would you create an iPhone version) one devkits etc & third-party development is authorised? It requires Java, once/if ever the iPhone supports Java than this should work with little modification. If I could choose I'd definitely love to see the support for the .TZX format and for the savestates. Probably I'm asking for a feature that is impossible to add... but it would be *really cool* if your emulator could automatically save the state when you exit from the dashboard, and reload it automatically when you re-enter the dashboard... so anybody might play a game for some minutes, go back to work and restart to playing from the very point where he (or she) left some hours before. OMG, this is truely awesome!!! Thanks Anon. Currently I have no plans for further development of this. Has it stopped working or is it just me? Thanks for everything!